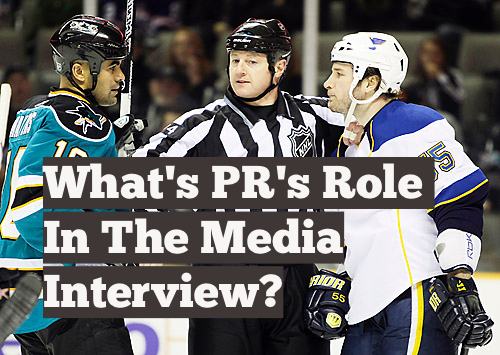 Should a PR person participate in client media interviews? Most would say yes, but that participation is usually limited. In most cases it means the PR rep helps the client prepare for a media interview opportunity in advance, offers background to the journalist, and accompanies the client to the meeting as a largely silent partner. Few professionals advocate for interrupting or stopping an interview midstream, or shouting objections like a defense attorney. After all, our goals include maintaining good relations with journalists whom we will inevitably need to approach for future opportunities. Yet sometimes the lines blur. The job of a PR pro is to help control the narrative. When does that mean controlling an interview? If an experienced spokesperson says too much or blurts out the wrong thing on the record, should the PR rep step in to correct it? It’s routine for a PR person to dial in to a phone interview or accompany a client to an in-person meeting. The PR rep can facilitate the exchange by making introductions and setting ground rules, supplying information when needed, prompting if something is missed, and generally acting as a second set of eyes and ears. And in the case of a mistake, a quick correction is invaluable. Most clients welcome the presence of their PR rep, particularly if they’re hyperconscious about speaking on the record. If the client is misquoted or if the interview doesn’t come out well, the PR person was there to help (or to vouch for them.) As for journalists, most accept the presence of a PR professional as long as they stay in their lane and don’t interfere. There’s that unspoken rule in public relations that PR practitioners should never be part of the story. Our role is behind the scenes, and most professionals are more comfortable there. But there are exceptions. In a famous 2009 episode, televangelist Benny Hinn conducts a rare interview with ABC’s Nightline in which reporter Dan Harris grills him about his lavish lifestyle. Hinn’s PR counsel Ronn Torossian can be heard from off-camera at multiple points during the eight-minute segment, occasionally protesting and urging Harris to mention his client’s newly released book. Torossian’s conduct would seem embarrassing, and it’s interesting that the network didn’t edit out his interruptions. But in this case his protests give his client the opportunity to play the good cop. Hinn insists on taking reporter Harris’s questions in the spirit of transparency. The exchange actually makes him look like an earnest guy who has nothing to hide. Was there a method to the madness? Who knows? Celebrity interviews can be different from those in corporate or brand PR in many ways. There, the publicist often takes the role as interview cop, especially with a reporter they deem overly aggressive. In 2009, Robert Pattinson’s publicist pulled the plug on a short interview with Ryan Seacrest after Seacrest asked a question about the actor’s relationship with then-girlfriend and co-star Kristen Stewart. The publicist was trying to protect the interests of her client, who apparently did not want to talk about his relationship. But in this instance, the PR pro’s on-camera demeanor made Pattinson look a bit helpless and pampered. After all, personal relationships are part of the game, and if Seacrest didn’t agree to ground rules barring the topic, why wouldn’t he mention it? Pattinson laughs off the awkwardness gracefully, but he should have brushed off the question for himself. In a crisis situation, the media spokesperson may face the toughest of PR challenges. In these cases a misplaced or misunderstood phrase can result in reputation and/or fiscal damage, deepening the existing crisis. Here it makes sense for a trained communications or legal professional to accompany any media spokesperson in a high-stakes interview, and journalists expect it as well. See our earlier post for a PR view of CEO apologies. Overall a PR professional walks a fine line between skillful management of a situation and undesirable interference. PR people act as facilitators, diplomats, and counselors, and the two most important factors in such situations are typically those that are earned over years of practice — experience and good judgment. Hello, I’m a student at Johnson C. Smith University. I’m doing an assignment which is about interviews for my Speaking in Professions class and I was assigned to be the PR. So, I was wondering for a PR, how would they handle an interview about their client who has gotten into a bit of legal trouble. What should they say and not say? Thank You. Hi, Meghan. Although there are times when a professional PR person will speak publicly for their client, it’s not usually the case. In most instances it’s best when the individual (or a company representative) speaks directly about the issue, whether in a media interview or through a written statement. There are too many variables for a client interview to go into here, but suffice to say that an enormous amount of preparation is involved!